This part of the BeHappy! website provides access to over a thousand happiness-building quotes and poems for your daily use. There are quotes on relationships, motivation, wealth, spirituality, general happiness and more. New QUOTES and POEMS are added every month. So use them to inspire and motivate you ... and help make you happier. There are many great quotes on happiness. Some of them are truly profound, others are just quick reminders of why we should be happy or how to be happier. As simple as it sounds, it really works since quotes can be used as constant motivators and daily reminders of what makes you happy, why you should be grateful, and why you can be happy today. Check out many of the great quotes in each category in the box to the right. Also, make sure to get my free gift ebook of 1000 quotes by filling in the blanks in the box to the far right and I'll send it to you FREE as a gift from me. 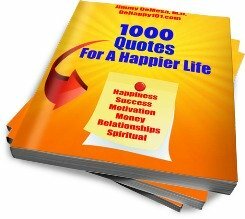 I have divided the quotes into a few separate sections related to happiness so you can easily access quotes that relate to a particular area of interest for that day or week (use the links in the table to the right or at the bottom of the page related to the type of quote you need). 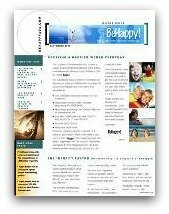 To get the most out of the BeHappy! system, you should read at least one of these quotes everyday (which you can do easily by just clicking on the "BeHappy! Thought for Today" button at the top of this page (and on many pages of this site, including the homepage). I put up a new "Thought" (quote) every morning (365 days a year), usually before 6:00 a.m. and then add all these quotes to the appropriate links on this page every month so you can return here to review them often. So make sure to check back often for the next great quote which could change your life. Write a few down in your journal, daily planner, or PDA/smartphone. Set some up on your computer's screensaver. Or, just memorize a few simple ones and recite them to yourself daily. Poems about happiness are also a great way to feel and communicate your true feelings of happiness. Click on the link in the box above to open a list of happiness-building poems. New poems are added regularly so you can access new and relevant works on a regular basis. Use these as needed for additional ways to maintain that little extra needed inspiration. All these quotes and poems represent some of the little things you can do in your life that can add up to make a big difference in the way you live your life and the way you feel. And if you have a favorite quote or poem you think may help others, please send it to me by filling out the form at the bottom of this page and I'll add it to the list so others can benefit from it.